Americans, even the most jaded liberal, generally accept that the mainstream media doesn’t care for Donald Trump and is more than a bit biased toward the left, Obama, and Clinton. 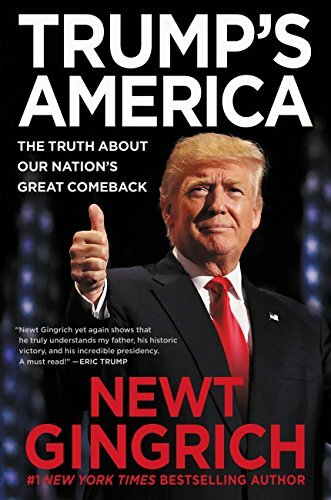 Newt Gingrich has documented in Trump’s America: The Truth about Our Nation’s Great Comeback what Trump has done to meet his campaign promises and the steps he has made toward his agenda of making America great again, because the media has reported so little positive. I didn’t read the description before I nabbed this book. I just thought I’d see what Gingrich said about Trump’s America, expecting it to be mostly political posturing and bluster with some pertinent data now and then. I expected to hate this book overall while finding nuggets of useful truth. Why? Because I hate comb-overs (petty, I know), wince at Trump’s sometimes strange tweets, and I haven’t trusted him (or any other politician) to keep his campaign promises. I grabbed this book because I thought it might be a decent way to catch up on current events and Trump-age. I have a confession: I don’t watch political news that closely anymore because, frankly, I don’t trust the media or the American political system. I’m tired and I’ve lost the idealistic faith in our country that had me tromping through the snow in New Hampshire with other college students going door-to-door campaigning for Reagan. I think I’m a pretty average American in that. I mean, don’t you sometimes want to just scrape our whole entrenched multitude of elitist, rich, clueless, condescending politicians right out of their offices and start over? Don’t you sometimes long to throw them all out, get a fresh crop, establish term limits, give candidates all the same amount for campaigning, and just start over with zero professional politicians, zero elitists, and get some people in DC who actually understand what it’s like to be a regular American? Well, Trump comes as close to a non-professional politician as it’s possible to get. And he’s got the plain speaking down… but how is he actually doing as President? Trump’s America is a blow-by-blow explanation of some of the major actions and policies that Trump has made so far in office in many areas, including immigration, freedom of religion, trade, free speech, economic policies, tax cuts, judiciary appointments, healthcare, fake news, the rule of law, bureaucracy, addiction, welfare reform, and our expansion into space. I left this book feeling as if I just took a refresher crash course in civics and government, past, present, and hopeful future. I was surprised at the accounting of how many campaign promises have been kept and how much real work Trump has accomplished since he took office. Trump’s America is a dense read with a lot of explanations and historical/background data, an appendix of Trump’s speeches, and a lot of endnotes. Mr. Gingrich was thorough and his backup data is comprehensive. I reached the end convinced that while we haven’t enacted my pet plan of scraping DC down to the bedrock and populating it with non-professional political idealists, Trump might be better due to his past experience in business and his no-nonsense get-it-done-or-get-out-of-my-way attitude. He’s blunt, plain-spoken, and sometimes a little over the edge, but he’s actually making headway in helping ordinary Americans have a higher wage, attracting American businesses and dollars back to America, returning to a more orderly and sustainable plan for immigration, etc. He’s not perfect, he’s polarizing, and he’s not always politically correct, but Trump has been good for America. Surprisingly good. Highly recommended for those with open minds or a Republican/Trump bent. Die-hard liberals will probably just want to set their book on fire.